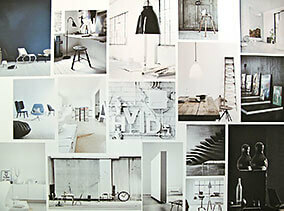 This Mood Board sends out a strong message in favour of a simple and colour neutral feel. This mood board reveals the virtues of contemporary interior design with it's uncluttered and colourful appearence. 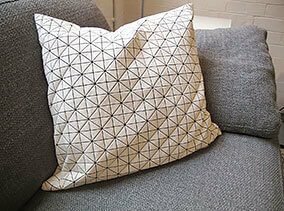 Cushions provide comfort and introduce a decorative element to the overall design. At the start of an interior design project it’s a good idea to get the ideas flowing. One way to do this is to create a mood board. It consists of images that embrace two different aspects. The first comprises furniture that catches your eye: it could include a sofa, rug, fabric, coffee table or wall covering. The second ingredient consists of examples of interesting, thought provoking spaces. These spaces would normally be blessed with natural light and be well proportioned. If you wish, feel free to produce a more abstract mood board - perhaps comprising of geometrical shapes or fusions of colour. In short: a more ‘emotional’ response. 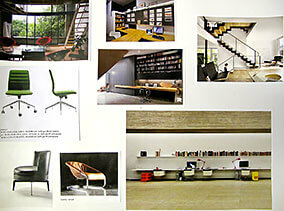 Produce one mood board A3 format, portrait or landscape. (A3 is twice the size of A4). Press the video button for Session 2 to see some examples. Aim to produce an attractive board that reflects your thoughts. Remember: you can’t do anything wrong with a mood board, you’re not fixed to anything but do choose spaces that are domestic in size. Images of proposals for the extension to Terminal 5 Heathrow Airport should be avoided! Arrange your board as you wish. Has the process of creating the board helped you to collect your thoughts? Will Alsop starts his design processes with a painting: he finds it’s a useful way of working and forces him to think about a project on a more conceptual level. Have you mastered this session? Make notes of lessons learnt and prepare yourself for the next Session. 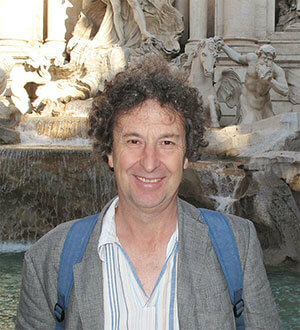 Keith hopes you have enjoyed the Sessions 1 and 2: to continue you need to register.